This is a common worry about people coming to the gym. Where can they eat and can they find healthy options or even vegetarian dishes in the camp? Some people love Thai food but for others it can be a bit spicy and prefer Western dishes. We have a restaurant in the camp. It’s called Good For you and you can find it next to the pool. It offers a nice quiet space to enjoy your meal. And after training, you will get hungry! 3,000 Baht for 2 meals per day for 1 week. The restaurant is open Monday to Saturday and closed on Sunday. 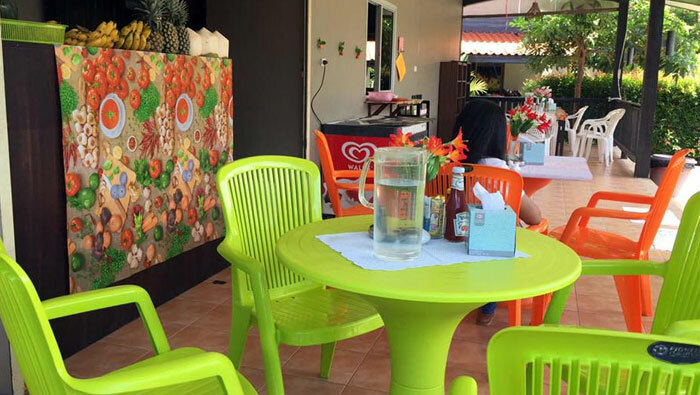 The restaurant offers both Thai and Western food at affordable prices. You can eat for about 300-400 Baht per day. The dishes are healthy food, like salads, wraps and fresh fruit smoothies, protein shakes, etc. The cook is flexible and can offer vegetarian versions of the dishes. The restaurant is located next to the swimming pool and is open Monday through Saturday for breakfast, lunch and dinner. More options include the Tik’s Restaurant down the gym road. This is a popular option for dinner. Tik has been a longtime friend of ours. She has a lovely personality and offers cooking lessons too. Just ask her. Around the corner there is another from the gym, to the left, there is a little hut that offers breakfast only. Sit down, don’t be shy, and don’t worry about ordering. They have only one dish, Kanom Jin, noodles. You can add fresh vegetables and sauce. It is a popular breakfast hangout for our trainers as it’s cheap and provides a healthy meal full of fiber. They also have tea and coffee available. Around the corner in the opposite direction, you will find a small garage that becomes a restaurant in the evenings. They offer Thai food and it’s quite tasty too. This place is popular with the expats. Further down, towards town you will find the night markets. You can eat there or buy food and take home.